Russia’s weakening diplomatic position and the strategic and political interests of France and the United States point to a military intervention becoming increasingly likely in Syria. Moscow understood back in 2015 that the Obama administration would not intervene in Syria and hence saw for itself an opportunity to save the regime, while gaining a foothold in the Middle East, from which it had been largely absent since the collapse of the Soviet Union. Russia’s air support was decisive and very quickly, its presence has become essential in the region because of its close ties to all stakeholders. The announcement of the withdrawal of most Russian troops from Syria in December 2017 was supposed to lead to peace negotiations and to a political compromise that Russia would sponsor – although this has not yet materialised. Today, Russian diplomacy, driven by its conflicting interests, appears to be seeking a political solution to the crisis irrespective of the will of the Syrians and Iranians, who prefer to maintain the conflict on military grounds. Indeed, the internationalisation of the conflict means that Russia must square its contradictions: the desire to maintain good relations with Israel, concern and mistrust over the growing influence of the Iranians, its strategic partnership with Turkey, and the need to protect Damascus. Vladimir Putin is trapped between adopting a uniquely military approach, which would result in cutting off Syria from Western and Arab countries to the benefit of Iran’s influence, or choosing to settle the conflict through political and diplomatic routes by involving western countries in the peace process. Doing so would undermine Russia’s interests in the region. In addition to this diplomatic conflict of interest, the assassination of the ex-Russian spy in London has pushed the United States and the European Union to enforce major diplomatic sanctions. This action has two consequences: the first is that the use of poisoning in broad daylight to assassinate the ex-spy has now served to convince western leaders that after Obama’s leading from behind doctrine, Russia no longer believes that western countries are capable of a hard-power confrontation. Second, the accumulation of the diplomatic sanctions, in addition to the economic sanctions already inflicted following the annexation of Crimea and the bogging down of the Russian army in Syria has weakened Putin, and has created an opportunity for Washington and Paris to restore the balance of power in Syria. The recent Turkish military intervention in Syria has weakened the Kurdish People’s Protection Units (YPG), which were until recently the guarantor of a western presence in the Syrian conflict. Indeed, the YPG was trained and armed by the United States, and many soldiers from the Special Forces were present in Afrin and are now in Manbij. The recent diplomatic crisis between Ankara and Washington and Erdogan’s objective to pursue the military advance to Manbij revealed the deep strategic disagreement between the two historical allies. The Turkish army is more powerful than the YPG, despite the former’s dysfunctions, which became apparent during Operation Olive Branch – mainly due to the massive purge that Erdogan carried out in the Army following the failed putsch in 2016. If the YPG is destroyed by Turkey, Washington’s influence will disappear from Syrian territories. As such, a military intervention can bring the United States into the Middle-Eastern power game and uphold its interest in the peace negotiations. Public opinion is generally not in favor of a military intervention, especially in the Middle East. The American and British military intervention in Iraq and the French one in Libya and Sub-Saharan Africa has pushed the public against any military involvement in Syria. However, after 7 years of conflict, the continuous stream of Syrian refugees brought the issue closer to home. Moreover, the images of the Syrian population’s terror after the airstrikes and chemical attacks in the wartorn country appear to have convinced the public that a limited military intervention would be the least bad solution. In Washington and Paris, strategic interests meet political ones. 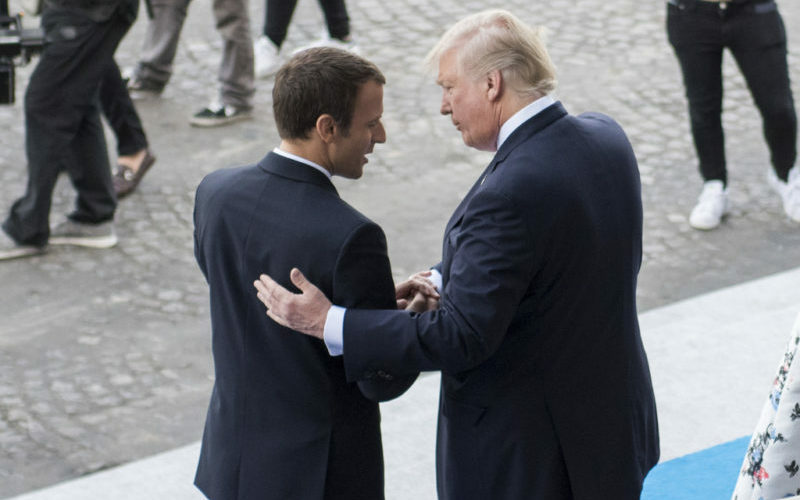 For Donald Trump, the intervention will allow him to hinder the Iranian influence and for Emmanuel Macron, this completes the return of France in Middle Eastern affairs. What are the stakes of this military intervention? For now, no one knows the extent of the upcoming military intervention. It could be a short bombing raid similar to the one carried a year ago against a Syrian military base or it could be a massive destruction of Syrian military forces to avoid any future chemical attack. The options are limited because in all cases, the bombing must avoid killing Russians on the ground. However, Russian military advisers are fully integrated into Syrians troops. It also remains to solve the crisis between Turkey and the United States. NATO is worried about a rapprochement between Turkey and Russia, and intervention in Syria could bring the Turkish and American positions closer together. Indeed, the Turkish intervention to eliminate the YPGs in a predominantly Kurdish region dismisses the thesis of a short and focused intervention from the Turks. Everything suggests that once the YPG is put out of action, the Turkish forces will remain present to ensure that the Kurdish threat does not resume in another form and to install the buffer zone they have always wanted. The area controlled by the Turkish army will thus have a direct border with the territory controlled by the Free Syrian Army (FSA). Ankara has always supported the FSA, which is based in Istanbul. The new presence of the Turkish army therefore suggests that the transport of military equipment to the rebels by Turkey will be now more important, which means that the rebel group would become the new principal and common partner for the United States, Turkey and France. Next articleBitcoin, Blockchain and the Asian Market: Is there Value Beyond Trades?